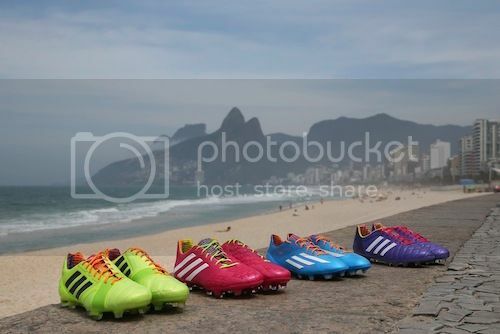 A world leaders in shoes and apparel, adidas recently launched the Samba Collection, Brazilian inspired football boots aimed at celebrating the vibrancy and exuberance of the World Cup host nation. For the first time ever, as part of the Samba Collection adidas has released a new boot from each of its four boot ranges, adizero™ f50, predator®, nitrocharge™ and 11pro, with an array of new bright, exciting colourways. Each boot has been designed with its own distinct identity and cutting edge technology, inspiring the next generation of footballer. The Samba Collection launch marks the start of the adidas “All in or Nothing” 2014 FIFA World Cup Brazil™ campaign. The tournament is the world’s largest event and the ultimate platform, where it will be Game On or Game Over for the World’s best teams and federations. The full roster of adidas star players will be involved in the campaign from Leo Messi and Oscar to Dani Alves and Mesut Ozil. nitrocharge™, the energy-retaining football boot designed for the next generation of footballer as worn by Dani Alves and Ezequiel Lavezzi, comes in a new visually striking lime green colourway. As a boot designed for ‘The Engine’, the player who is always running, tackling and relentlessly powering his team, the Samba nitrocharge™ encourages its wearer to go Full on or be Gone. With its unique and highly elastic ENERGYSLING™ around the forefoot supporting sidecut and precision turn movements to sharpen reactions on the pitch, and ENERGYPULSE™ spring technology providing high energy push-offs and long lasting energy return when sprinting, the nitrocharge™ combines new technologies to innovate the way ‘Engines’ play the beautiful game. The adizero™ f50, long sought after by the fastest players such as Leo Messi, Lucas Moura and Gareth Bale, empowers its players to Fly or Die with an electric sky blue colourway. The adizero™ f50 is all about precision engineering with every aspect of the boot design based around making the wearer as fast as possible on the football field. With features such as SPEEDTRAXION, an all-new, high speed stud alignment for maximum acceleration and pinpoint changes of direction, and SPEEDFOIL, a revolutionary material that combines lightweight, softness and durability for a comfortable, yet locked down heel fit, the Samba adizero™ f50 is a boot which ensures these world class players will be faster than ever before in Brazil. The vibrant pink colourway of the Samba predator® Lethal Zones favoured by the likes of Oscar, Mesut Ozil and Fernando Torres instructs its wearer to Hunt or be Hunted. Designed with five distinctive ‘Lethal Zones’ of technology to deliver outstanding ball control, touch, accuracy and power, the boot is made to master every aspect of performance. With a luxury deep purple colourway, the Samba 11pro worn by Philipp Lahm, Hernanes and Frank Lampard retains the classic attributes that allow players to Make the Play or Make Way. With its premium, ultra-soft and ultra-light Taurus leather providing excellent fit, performance, comfort and ball-feel allied to an all new outsole with comfort frame for better pressure distribution, as well as optimised stud placement for maximum grip and acceleration, the 11pro remains the boot of choice for the complete footballer. The Samba Collection launches today in conjunction with a Brazilian inspired video featuring key players who will wear the boots. The 90 second-long video features a brand new track, “BOTA”, from prominent act Buraka Som Sistema, who partnered with promising newcomer Brazilian MC Karol Conka (cult.cartel). Karol delivered the lyrics and appeared in the spot, adding local flavour. The band will be release the track as their next single and will be available to download from the adidas Football Soundcloud channel, soundcloud.com/adidasfootball from today. The most exciting professional players in the world will wear the new adidas Samba Collection boots on field from November 9th onwards, with the boots available to purchase from 14th November at adidas own-retail outlets as well as specialist stores worldwide. For further information please visit adidas.com/football or go to facebook.com/adidasfootball or @adidasfootball on twitter to join the conversation.